We’ll sing of his goodness and mercy. I found one more General Conference activity packet -- and this one has updated general authority pictures! On Thursday night, Peter watched part of the Vice Presidential debate. After a while, I'd had about all I could take of people arguing, twisting one another's words and saccharine-sweetly telling each other they respected them for opinions that they don't really hold. I used Elizabeth's walk as an excuse to get us out of the house, but Peter and I ended up talking politics the whole time. By the time we got home and got dinner on the stove, I was incredibly hungry (Elizabeth didn't take a nap at lunchtime), dehydrated (nursing mothers need to drink LOTS of water), headachey, and grumpy. I've been trying to fight off a blue funk that appeared out of the blue this week, and it's been letting all sorts of anxieties start to overwhelm me. The house isn't selling, and who knows if there will be anybody to loan money to a buyer in our price range? Speaking of selling the house, it's killer to try to live at this pitch of cleanliness, and I haven't been keeping up since I got back from the trip. I haven't had decent sleep in weeks, and the other day I put Elizabeth in her crib and let her cry while I napped for an hour (which shows you how tired I was, 'cause her cries are usually better than an alarm clock for waking me up). I have no appetite, but have other hungry mouths to feed, Peter's been complaining about his temp job, and I just got word that another friend died as a result of a disease I have, and live with symptoms of every day. I read in the Ensign that there are appalling numbers of abortions in our nation, and in the voter packet that they need a law to make sure pregnant teenage girls actually tell their parents before getting an abortion. On top of all this, you want me to figure out how to fix the nation's Health care problems, immigration, and decide which of the two lying politicians I should pick as leader of the free world? It's too much! I can't deal with it, and my brain is starting to shut down. I simply can not think about certain things if I want to survive. As tired as I am, I often can't fall back to sleep after the 3 am feeding because my mind is too busy. I know I need to take care of myself, but it's really hard sometimes. And then we had General Conference. I didn't hear every word of every talk (Elizabeth isn't nearly as interested in listening as I am, or as interested in napping during Conference as her dad is -- though he stayed awake through the whole thing this time! I'm so proud of him! -- and then there was the termite inspector...), but what I did hear really touched me. I guess I'm not the only person in the world who has been hit with tough economic times, and is overwhelmed by the world's calamities, and honestly, When I really think about it, I haven't been hit as hard as most. Before I go on, I'd like to thank Mormon Times for posting quick summaries and quotes from the talks, since the official transcript won't be up on LDS.org till Thursday at the earliest. President Monson reminded us in the very first talk that our Heavenly Father is mindful of each one of us and our individual needs. Elder L. Tom Perry talked about mortal life as a cycle of "good and bad times, ups and downs, periods of joy and sadness and times of plenty as well as scarcity" he also said that "One of the challenges of this mortal experience is not to allow the stresses and strains of life to get the better of us." Elder Elder Neil L. Andersen also talked about challenges, difficulties, questions, and doubts, but reiterated the comforting words: Fear and faith cannot coexist. In our days of difficulty, we can choose the road of faith. Elder Dallin H. Oaks said that we live in the "perilous times" prophesied by the Apostle Paul. and warned that we can get distracted, degraded, downhearted or depressed unless we stay focused. President Dieter F. Uchtdorf gave a beautiful talk about Hope, which I really needed. (I'm borrowing most of the Mormon Times summary here) He said that it's one leg of a three-legged stool, together with Faith and Charity that stabilize our lives regardless of the rough or uneven surfaces we might encounter. Hope has the power to fill our lives with happiness, but its absence, when the desires of our hearts are delayed, can made the heart sick. We have the responsibility to make hope an active part of our lives and overcome the temptation to lose hope. In opposition to hope, despair drains from us all that is vibrant and joyful and leaves behind the empty remnants of what life was meant to be. It kills ambition, advances sickness, pollutes the soul and deadens the heart. Hope is not knowledge, but rather the abiding trust that the Lord will fulfill his promises. It is confidence that if we live according to God's laws and the words of his prophets now, we will receive desired blessings in the future. It is believing and expecting that our prayers will be answered, manifest in confidence, optimism, enthusiasm and perseverance. Elder Joseph B. Wirthlin told us about his mother's wise words: Come what may--and love it. He counselled us to laugh in the face of adversity and seek for the eternal. I liked when he reminded us that "the dial on the wheel of sorrow eventually points to each of us." and that it's useless to say "why me?" when everyone is singled out sometime. My favorite line from his talk was: Sometimes, the very moments that seem to overcome us with suffering are those that will ultimately suffer us to overcome. He finished by saying that the Lord compensates the faithful for every loss. That which is taken away from those who love the Lord will be added unto them in his own way, and not even death can take from us the eternal blessings promised by a loving Heavenly Father. Later in the day, I was thinking about Elder Wirthlin's talk, especially the "suffer us to overcome" line. The Spirit brought to mind the image of me putting Elizabeth into her carseat or holding her while the doctor gives her shots. I'm saying, "I know you don't like it. I'm sorry, but it has to be done. I love you. It'll be all right soon. It's only for a little while, etc..." I feel like today's conference talks were God's way of putting his arms around me and saying, "I know you're hurting, and I'm sorry, but it's only for a little while, and there really is a reason." Elder Jeffrey R. Holland gave a beautiful talk about angels. He said that angels are all around us, seen and unseen, known and unknown, mortal and immortal, but all doing the Lord's work of comforting and expressing God's love for His children. Heaven, he said, never seems closer than when we see the love of God manifested in the kindness and devotion of people so good and so pure that 'angelic' is the only word that comes to mind. God may feel far away, but he is always watching and assisting his children. Elder D. Todd Christofferson spoke about Zion. This evening, Mom and I were talking about what he said about materialism. We don't need things to make us happy, but the Lord knows we like things, and sometimes leads us to good deals so we can have the nice things we like without having to pursue materialism. A friend of mine saw Elizabeth's pumpkin hat and asked if I'd thought about selling them. I said that unless somebody was willing to pay $25 or $30, it wouldn't be worth my time. Later, she was looking at it closely, and asked if I really had just made it. I said that I had, and said I'd make her one. Only on my way home, did I realize that doing it for money isn't worth my time, but doing it for friendship totally is. I think I'm doing all right on the materialism scale this week. Elder David A. Bednar's talk reminded me that I ought to spend more time in prayer, thanking my Heavenly Father for the things our family has rather than just requesting the blessings I think we need. Peter, Elizabeth and I are all relatively healthy. We have a home that's not going into foreclosure. Peter has a job that pays enough that we're spending less than he makes, even when I go out and buy craft supplies for Halloween costumes and pumpkin hats. I have a wonderful husband who loves me, and didn't use money problems as an excuse to start fighting and ruin our relationship (like some people I know). We have a beautiful daughter, who's learning new things, and even when she doesn't nap (like this week), she has the best temperament of any baby I've ever met. Even the songs at conference were perfect. After sobbing through most of Elder Holland's talk, we were asked to sing with The Primary Choir. Teach me to walk in the light of His love...wasn't just referring to the academics of the scriptures (as we were reminded by ELder Causse), it's about the light of God's love that drives out the darkness of dispair, and I needed to learn about it today. Come little child and together we'll learn. It's nice to be reminded sometimes that I don't know everything (because if what I know is all there is, then the world is a pretty depressing place). The last hymn was the best though. The second verse of that song never sounded so appropriate before (if you weren't paying attention, that's today's poem, with the relevant bits bolded). I don't doubt the Lord or his goodness. I've proved him in days that are past. I know that deliverance is nigh. I just need to be reminded of all that. I am not the only person in the world right now that feels anxious, overwhelmed and depressed. It's pretty clear when so many of the talks focus on the same issues, that they're issues that are important to many Saints. 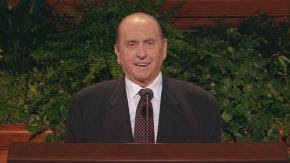 Today's Conference talks, and the movie about President Monson that they showed between sessions, reminded me over and over that Heavenly Father hears and answers the prayers of His children. He loves me personally, and has a plan for my life. My adversity and afflictions shall be but a small moment, and if I endure it well, God will exalt me on High. It really is all gonna be okay. I enjoyed the talks a lot, too. thanks for your conference message. i'm so sorry about your economic difficulties. It's so stressful. had a disease like that. The disease is Clinical Depression. I just heard a few days ago that another of my friends committed suicide because of untreated depression. I have, at various times in the past considered it myself, and though I've always been able to convince myself that it's a bad idea, it's something that Peter and I have to be aware of and careful to avoid. It also makes it hard to get medical and life insurance because I'm just too much of a risk. Oh, I'm so sorry about your friend. A lot of people in the church get the idea that it is shameful to struggle with depression and to take drugs. The idea is preached a lot that if you turn to christ properly, you of course won't have those feelings. This really bothers me. I'm glad you are so open about your struggles, because i think it helps people understand it better. I'm grateful for the ensign article a couple of years back that compared depression to cancer and said people in the church don't tell cancer patients to turn to christ and and he will heal them of course. I totally know what you mean about getting preached at. One comfort I have is that at least official statements and an increasing number of Ensign articles now acknowledge a difference between situational and chemical depression. Transcripts aren't online yet, so I can't check my facts, but I seem to remember somebody in an early session of General Conference saying something along the lines of: "For some, depression is a dangerous disease that requires professional treatment, but there are others who get excessively worried and depressed because of tough times. It is to those people that I wish to offer my message of hope." On the other hand, I've found that even if it is not a practical cure-all for Clinical Depression, finding hope in Christ's atonement can be a real comfort. To use the cancer analogy, which I think is a good one, the Church does tell people with cancer to find comfort in their afflictions by focusing on the eternal plan, and asking in faith for the healing power of Priesthood blessings. They are reminded that Christ has suffered all things that he may succor his people, etc. I have found that along with following my doctors orders, getting good counselling as needed, and taking drugs when the disease is acute, I have been able to get the Major Depression into remission. I now manage the remnant by focusing on my family, my faith in Christ, charitable service, and fellowship with the Saints (especially the other moms in our enrichment sponsored playgroup). That's why I enjoyed the talks so much this week-- they reminded me that most of what I'm feeling right now is situational, and that my situation isn't as bad as I sometimes let myself believe. Thanks for your kind words. As part of my eternal family (one of the things that really matters in life), it's important to me to have a good relationship with you, so your expressions of support really mean a lot. Would you mind if I posted these last few messages between us as comments on the blog post? One day (when they can get the software to work right), I intend to print the blog and comments out as a kind of journal to leave to my children. I think that the comments put my relationships in context, so I usually copy the ones sent to the family list onto the website version. I was reading over the conference talks that you enjoyed and was surprised that we liked pretty much the same ones. Actually, I wasn't too surprised, I think Hope is something that everyone could use in their lives at this point in time. As I was reading, though, I noticed that you mentioned a health concern that you live with. You didn't specify what it was, and I don't want to pry, but I want to make sure that you are o.k. Is there anything that I can do for you to make your life any easier? Are you on medications that can help you survive whatever you are dealing with? fantastic job with Elizabeth. It is so hard to be a mother and you seem to be doing it with so much grace and patience. Evidently you weren't the only one who missed what I was referring to. I've explained it in the comments, but I'll give you a quick rundown. In the previous post I talked about my friend who committed suicide -- the second one I've heard about this year. Since I live with mental illness, and have thought a lot about suicide in the past, it's kind of scary to be reminded that it's not something to be taken lightly. I was also recently turned down for life and health insurance because of my history of depression. Currently, I'm managing without medication (I quit before getting pregnant), and it's mostly okay, but the situational stress has been pretty bad at times in the last few months. I use the coping strategies I've learned in therapy, and try to focus on living in the moment with Elizabeth and Peter. I really enjoy reading your blog. You say things so well and express yourself with boldness and honesty. Thank you for writing. I didn't realize you struggled as much as you say you are. My heart and prayers go out to you. I understand in ways I am not bold enough to state in so many words. I am glad for you that you have Peter who is obviously your friend, and Elizabeth who as a child has the capability of touching a mother's heart in a way no one else can. Hang tough and keep writing.